Although Universal Orlando positions the Royal Pacific Resort as a "Preferred" hotel behind its "Premier" properties, Portofino Bay and Hard Rock Hotel, and sets its rates accordingly, it sacrifices almost nothing in luxury or amenities. 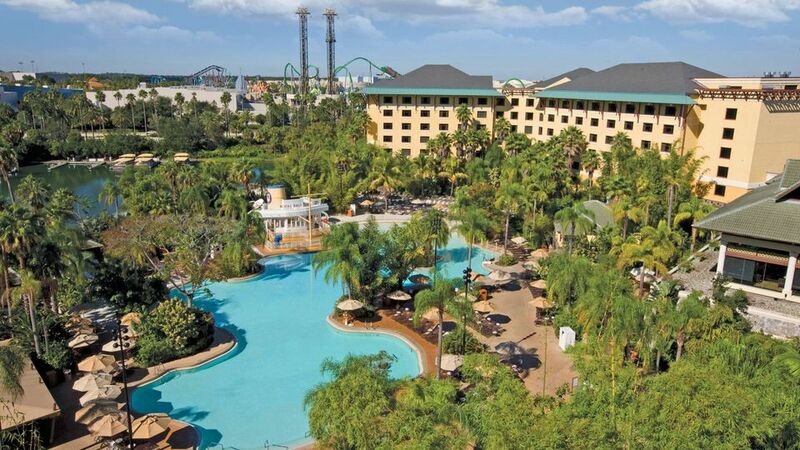 With everything it has to offer, not the least of which is reasonable prices, this is a great place to stay at Central Florida's other theme park vacation destination. When Universal Orlando announced in the late 1990s that it planned to build three on-site hotels in its bid to transform into a full-fledged vacation destination like its mouse-eared neighbor, it said that the Royal Pacific Resort would be its third-tier property behind the more upscale Portofino Bay and Hard Rock Hotel. However, they may have forgotten to tell the hotel's designers and builders. From the moment you enter the lobby, with its teak wall hangings and lush orchid garden, everything about the Royal Pacific Resort says luxury—except the price. Using Disney's hotels as a comparison, you'd expect the Royal Pacific Resort to be something like the decidedly budget All Star properties. Instead, the Universal hotel leapfrogs over Disney's moderate offerings, like the Caribbean Beach Resort, and compares favorably with the Mouse's deluxe hotels like the Polynesian or the Animal Kingdom Lodge. Like the best themed resorts, the Royal Pacific extends the theme park fantasy into a round-the-clock immersive vacation experience. The smells of the teak wood and the South Seas-inspired dishes, the sights of the bamboo bridge and the colorful Balinese umbrellas, the sounds of the conch horns and wood flutes--the hotel fills your senses and conspires to transport you to another time and place. But, not too far away. Unlike Disney's massive complex, the much more compact Universal campus offers some striking differences that are both bad and good (although, more good than bad). Instead of Disney's labyrinthine mass transit system of buses and monorails, guests at the Royal Pacific Resort (as well as at the other two hotels) can hop aboard one of the frequent launches for a quick boat ride to the parks, or take a short (and lovely) walk. On the flip side, it's hard to maintain the South Seas illusion when you can hear and see riders screaming at Islands of Adventure, just beyond the shoehorned resort. Speaking of screaming riders, one of the best reasons (the best?) to stay on property at Universal is the incredible "No Line, No Wait" program. With a flash of a room card key, hotel guests can walk right on to nearly all of the theme park attractions. During busy periods, this feature can be a blessing. (Heck, even during less-crowded times, it's pretty wild to get the ultimate in V.I.P. treatment.) See more Universal hotel guest perks. Elaborate themeing? Check. Luxurious aura? Check. All of Universal's benefits? Check. So what do you give up when you get to hang on to a few more of your hard-earned vacation dollars by choosing the Royal Pacific over the other Universal hotels? Not much. The standard rooms aren't quite as spacious (especially compared to the Portofino's massive rooms). But they are more than adequate and nicely appointed. The bathroom doors give a solid ka-thunk when they close, for example. The rooms' bamboo trays, filled with generous supplies of shampoo and other sundries, are a nice touch. The pool has no water slides (although it does have a fun luxury-liner themed play area with water cannons) and is more crowded than the Portofino's three pools. The restaurants are memorable. With fare like the Pistachio Crusted Mahi Mahi at the Islands Dining Room, guests get to sample some of the exotic tastes of the South Seas. Even the poolside Bula Bar and Grill, with its tropical specialties, is a cut above the usual fast food found at such eateries. The Portofino Bay, as befits its rates, is more lavish and secluded—almost hushed—than the Royal Pacific. The Hard Rock, on the other hand, is about as raucous as a hotel can get. But, in my estimation, the Royal Pacific offers Universal's perfect complement of luxury and value.